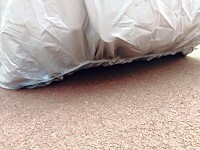 Protect your paint and interior in the heat with one of our Voyager fitted car covers. Our covers are tailored to each specific car, make, model and sometimes even the year. Door mirror pockets are included on models where the mirrors are large and obtrusive. For some cars we offer you the choice of covers with or without pockets. Now available in Voyager PLUS Format, Exclusive to Coveryourcar featuring our unique Hemline Underskirt Tension System. Want to Buy a Voyager Cover? Voyager car covers are light yet very strong and ideal for Summer frequent use..
At CoverYourCar, we have worked hard to ensure that our unique designs result in production of the highest quality lightweight car covers that are available today. These covers utilise modern high-tech materials that combine reflective breathable fabric with strength and durability. Double stitching and heavy duty elasticated hems combine to ensure that maximum protection for your cars paint and bodywork is maintained through years of service. Voyager covers are suitable for both indoor and outdoor use. They are Breathable, 100% ultraviolet resistant, showerproof, snow, sunlight, dust, dirt, tree sap, birds etc., and those annoying little scratches. They are suitable for year round use, helping to keep interiors cool in hot weather and protecting from frost and snow in winter. They also have good compressability, taking up very little space and are ideal to tuck in the boot and take on a journey. Sturdy underbody securing straps are provided, so however stormy the weather, you know that your car is secure and protected from the elements. We also provide special silicone covers that can be fitted over the underbody strap connectors to prevent scratching of paintwork. Comes with a one year manufacturers warranty against product failure. Upgrade your Voyager to a Voyager PLUS for the ultimate in secure fitting and peace of mind with our exclusive Hemline Underskirt Tension System. Ideal for a car that is used frequently where a totally 100% waterproof cover is not required. In this instance a Monsoon or Stormforce (or PLUS) should be chosen.